Our location is convenient because is well connected to major tourist destinations of Campania: Capri, Ischia, Pompeii, Herculaneum, Positano, Ravello, Amalfi and Naples. Our B & B, which occupies a building of 700, is located in the historical center of Meta, not so far from the center of Sorrento, and a short walk from the beautiful beach of Alimuri. The main door opens on a flowery patio where overlook the rooms, all rooms have private entrance that ensures an hospitality intimate and also familiar. The rooms are about 20 square meters and with private bathroom. The style of the furniture, colorful, lively and imaginative, was personally supervised by the owners. Take the train Naples - Sorrento called Circumvesuviana, it takes about an our to arrive in Meta. After stops of Vico Equense and Seiano, get off at Meta. Once off call the B & B. From Naples's Capodichino airport, the most comfortable way to get to the B & B is to take the bus Curreri company that leaves the square in front of the arrivals terminal. The bus takes 50 minutes to get to the cathedral of Meta, when you'll arrive to the cathedral call the B & B. From the airport of Fiumicino in Rome, you can go to the Tiburtina Station and take the bus Marozzi or you can go to the Train Station - Termini and take the train to Naples, from Naples Central Station or Piazza Garibaldi, take the train Circumvesuviana. After stops of Vico Equense and Seiano, get off at Meta and call the B&B. 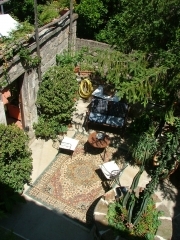 The B & B is reachable from the A3 Napoli- Salerno. Follow the sign Salerno - Reggio Calabria - Sorrento/Penisola Sorrentina exit at Castellamare di Stabia. Continue along the SS145 state road, past the towns of Vico Equense and Seiano until you each Meta. Entering the destination you will immediately, on your left, the cathedral. Turn the first right going down to the beach and call the B & B.